* 2 1/2 - 3 pints of Blueberries (frozen or fresh) - depending on the size of your pie plate. I always have more berries than needed. I like to have my berries heaping under the crust. Place bottom crust into the pan - pour in berry mixture. Cut butter into small pieces and evenly place butter on top of berries. Add top pie crust - seal edges and cut air holes into the pie. 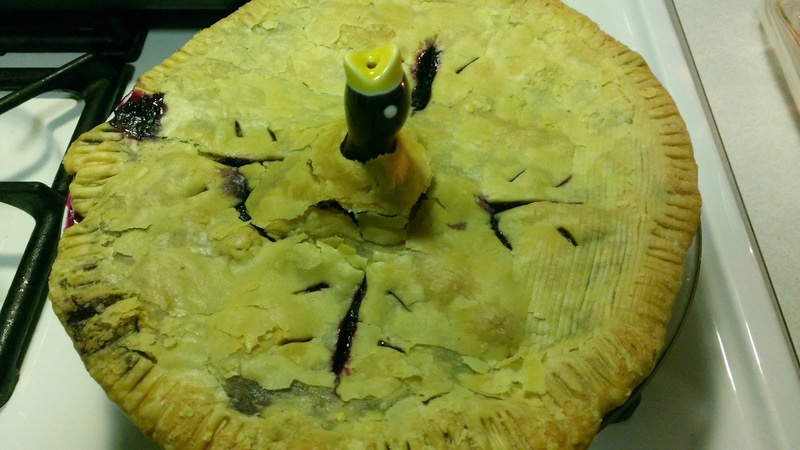 I place a pie bird in all of my pies. A pie tradition I started years ago. Bake pie at 375 - 400 degrees for about one hour. I place foil on my rim crust to make sure it does not burn. Wow, this looks heavenly! I am actually surprised at how few ingredients are needed for such a scrumptious pie! Thanks so much for sharing, this will be a perfect treat for spring. Yummy!